What's inside alcoholic energy drinks? The name "Four" is derived from the major ingredients: caffeine, taurine, guarana and alcohol. (CNN) -- Neon, caffeinated alcohol drinks often boast exotic-sounding ingredients such as taurine, guarana, ginkgo, bitter orange and ginseng. These give the beverage manufacturers clever marketing strategies, but do little else, said pharmacology and nutrition experts. The key ingredients in these drinks are alcohol and caffeine. The rest is "silly window dressing," said David Schardt, a senior nutritionist at the Center for Science in the Public Interest. Energy drinks became controversial after two colleges banned Four Loko, a caffeinated alcohol beverage, after students became ill. The name "Four" is derived from the major ingredients: caffeine, taurine, guarana and alcohol, according to Phusion Projects, Four Loko's maker. Video: 'Blackout in a can'? These types of caffeinated alcoholic drinks fuse sugar-fructose mix, caffeine, alcohol with a blend of supplements. "Lots of the energy drinks have proprietary substances in them," said Dr. David Weldy, assistant professor of family medicine at the University of Toledo College of Medicine. "We don't know what they are or what the ratios are. Some of the items -- taurine, guarana and certainly caffeine -- are major players. We don't really know all of their main effects." The amount of the herbal supplements in energy drinks are too small to have any kind of effect, said Kevin Clauson, an associate professor of pharmacy at Nova Southeastern University. "If you have a headache, it's like taking an aspirin, cutting it in half, then cutting that in half, then expecting it to have a beneficial effect," he said. "It's just not going to happen." Many of the energy drinks do not list the percentage of ingredients, glossing them over as "proprietary blend," Clauson said. Taurine is a seemingly omnipresent natural amino acid, largely found in skeletal muscles. It is one of many building blocks involved in physiological functions in the liver, brain, central nervous system and heart. "It's one of those things that doesn't fit into the paradigm of one product for one effect," Clauson said. "It has lots of different effects." Taurine is also one of the major ingredients in Red Bull and touted to improve performance. But there isn't much scientific evidence of that. Despite such lack of research, it has been used in treating alcohol withdrawal, congestive heart failure, diabetes and other conditions. Guarana is a South American berry that is a natural source of caffeine. "Some companies put guarana in to hide how much caffeine is in their products," said Schardt. "Lots of people don't realize what it is." Guarana is recognized by the U.S. Food and Drug Administration as a generally safe food additive. Its seeds contain more than twice the amount of caffeine found in coffee. "Functionally, it's another source of caffeine," Schardt said. "Just because the energy drinks put these ingredients in, it doesn't mean the ingredients do anything. We're back to marketing. It's what consumers think these ingredient do." Young adults and college students aren't drinking these types of energy drinks for health benefits or herbal supplements. The most critical ingredients are caffeine and alcohol. The stimulant and depressant don't cancel each other, but have a different effect. "Caffeine seems to partially cancel out the feeling of being drunk, not the actual impairment," said Weldy, who has written about underage drinkers and caffeinated alcoholic products. 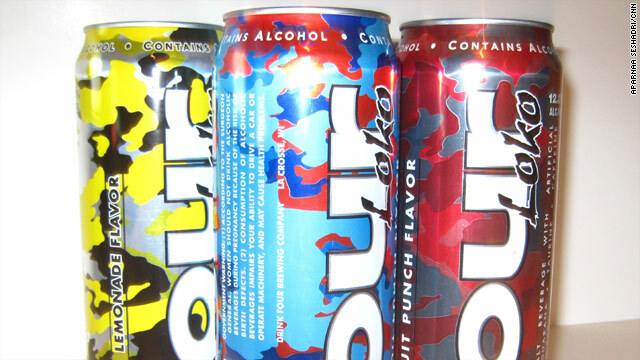 Four Loko's maker issued statement after the Washington college incident: "No one is more upset than we are when our products are abused or consumed illegally by underage drinkers -- and it appears that both happened in this instance. This is unacceptable,"
Phusion Projects agreed with "the goals that underlie those sentiments" in Central Washington College's ban. The company abides by "strict standards for our retailers and conduct ongoing training to ensure our products are sold only to adults 21 and older," they said. A 23.5-ounce can of Four Loko contains either 6 or 12 percent alcohol by volume, depending on state regulations. The combination of caffeine and alcohol -- which is found in drinks like rum and Coke, Red Bull and vodka, allows drinkers to imbibe for a longer period of time without quickly feeling the headaches, dry mouth and unpleasant side effects of alcohol, Clauson said. Drinkers of caffeinated alcoholic drinks are more likely to binge, drive drunk, or be taken advantage of in a sexual situations than those who drink noncaffeinated alcoholic drinks, medical experts said. This isn't the first time alco-pop has stirred backlash. In 2007, Anheuser-Busch pulled its 12-percent alcohol beverage called Spykes (a neon amalgam inside a bottle that looked like nail polish) after an outcry by alcohol watchdog organizations and politicians. In 2008, Center for Science in the Public Interest sued MillerCoors Brewing Company over its alcoholic energy drink, Sparks. The group accused the company of trying to appeal to underage drinkers with a drink that was alcoholic, but similar to soda. The company agreed to reformulate its ingredients.